WILLEMSTAD - In the absence of Curaçao government which actively informs the population about the health risk of the oil refinery, the environmental organization SMOC gives the frequency of a clock a monthly update. Well, in November 2014 it was quite hit again. 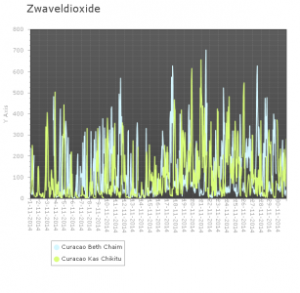 Preliminary measurements show that, at the height of Beth Chaim and Kas Chikitu, WHO standards for SO2 were exceeded many times (10 minutes average = 500 ug / m3, 24-hour average = 20 ug / m3). These excesses were in line with the complaints SMOC received last month from citizens who live in the shadow of the refinery. Situations like these are contrary to the Universal Declaration of Human Rights (Art. 25) and the International Convention on the Rights of the Child (Art. 24 and 29).